Dash Media Dutch world news It was this 99-year-old woman's dream to get arrested and she got it! 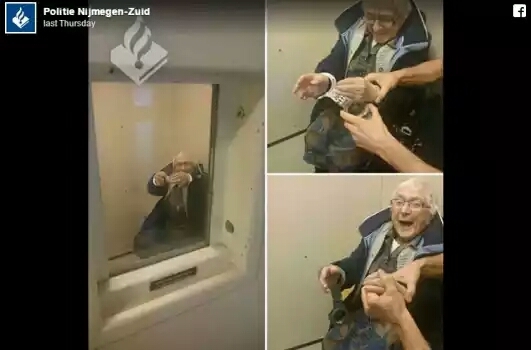 It was this 99-year-old woman's dream to get arrested and she got it! Perhaps, if you ask my grandma what she still want to experience in life, she might tell you, 'i want to see my great grand children, 'i want to experience the warmness of ikangusi waterfall' and all. But Annie's dream isn't like that, at 99 All she wanted was to “Experience a police cell from within.” To fulfill her dream, Annie’s niece contacted officers in the Dutch town of Nijmegan-Zuid to tell them about her aunt’s dream. And Annie got the full effect. she was picked up by the police, cuffed, and locked up and she was all smiles as she had the time of her life. 0 Comment to "It was this 99-year-old woman's dream to get arrested and she got it!"